With so many choices, which sealant is right for you? Why not just use silicone? When you drill a hole through your boat's hull to attach hardware, plumbing fittings or electronic transducer (such as knotmeters), you are effectively breaching the waterproof shell that holds your boat afloat! Holes are essentially a direct route for water to penetrate your boat's core material (the wood or foam sandwiched between the fibreglass layers of your hull) which can lead to catastrophic water damage. Even above the waterline, it is imperative that you seal every single hole with sealant - no matter how small! While many people refer to sealants as "silicone", a high performance sealant is rarely silicone-based.. so let's avoid getting them confused! We should state that while silicone still has its place in some places on a boat, it should never be used to bond hardware. Silicone is excellent for forming "gasket-like" seals, but provides very little actual adhesion between two surfaces. In other words, it fills the gap but that's about it. When in doubt about which type of sealant to use, we recommend polyurethane-based sealants. One important point to remember is the stronger a sealant is, generally the more difficult it is to remove! We recommend saving time and frustration by considering the Sealant Removers listed on our site. Don't let your jaw drop; for the most part, adhesive sealants are moisture cured! In other words, they cure better underwater than above! Just double check the label to confirm. 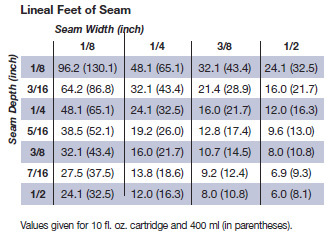 Here's a simple guide to the common and best selling sealants. We have added a silicone sealant at the bottom for comparative purposes! resistance properties making this an ideal cosmetic sealant. Conclusion: Use in areas where sealant will be exposed to direct sunlight (entire bead - not just the edges! ), such as bonding clear materials like acrylic or polycarbonates. Similar UV resistant waterproof surface as 3M 4000 UV. Conclusion: Use for bonding that does not require full strength and hardware which you know you will have to remove in the future! Conclusion: A lower cost alternative to 3M 4200. Conclusion: A great multipurpose sealant for jobs that need extra time to set up. A high-performance polyurethane adhesive sealant with amazing adhesion. Requires 7-14 days for full cure. Conclusion: Use in applications which require full strength - and removal is not a concern! High performance polyurethane with almost as much strength as 3M 5200 but much faster tack-free and cure time. A unique combination of marine silicone and polyurethane, formulated especially for fiberglass. LifeSeal offers a fast-curing, low odor, high adhesion, non-sagging, non corrosive, non-yellowing formula. Will adhere to polycarbonate. Conclusion: Since it can be removed from gelcoat without damaging its surface, perhaps best used in delicate situations where the strength of polyurethane is needed but surface must be safe from damage. A long lasting, permanently flexible marine polysulfide sealant that bonds to fiberglass, wood, metal, glass, and itself. Conclusion: Cures to a firm flexible rubber seal with excellent waterproofing and adhesion qualities. A mildew resistant non-sagging, moisture curing silicone rubber sealant. Conclusion: Ideal for head sealing applications. Also excellent gasket adhesive and formed-in-place gasket material. 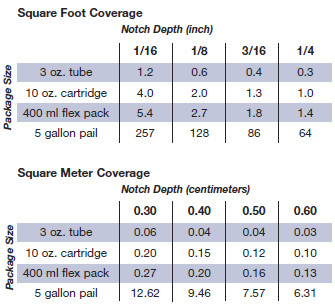 Given the desired diameter of a bead or the dimensions of a seam, the coverage obtained from a cartridge or flex pack can be looked up in the following charts. Note that the values are calculated for "no waste." The actual coverage will be based on application technique and overfill. Should it be necessary to cover an area with the adhesive sealant, the material should be dispensed from the container and spread with a trowel. Most trowels for spreading adhesives will have a notched edge to facilitate control of the thickness being applied. 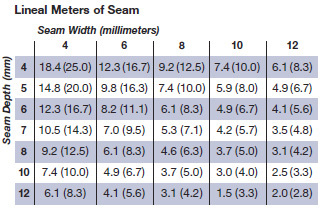 When the notch depth is known or can be measured the coverage area can be determined from the following tables. 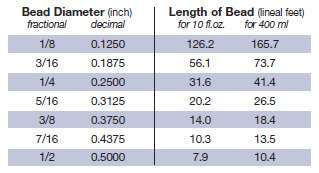 Should it be necessary to apply a solid layer of a specific thickness, take the value given in the following table and divide the area by two.